Since 1953, Memorial Healthcare System (MHS) has been a leader in providing high-quality healthcare services to South Florida residents. Today, it is the third-largest public healthcare system in the nation and highly regarded for its exceptional patient and family-centered care. MHS works with interactive advertising agency MoreVisibility to market its practice areas. In an effort to promote a new, free online cardiac risk assessment, MoreVisibility opted to incorporate Pandora into the media mix. 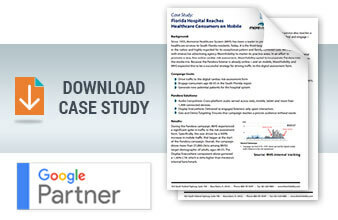 Because the Pandora listener is already online – and on mobile, MoreVisibility and MHS expected this to be a successful strategy for driving traffic to the digital assessment form. Audio Everywhere: Cross-platform audio served across web, mobile, tablet and more than 1,000 connected devices. Display Everywhere: Delivered to engaged listeners only upon interaction. Geo and Demo Targeting: Ensures that campaign reaches a precise audience without waste. During the Pandora campaign, MHS experienced a 500% increase in mobile traffic to the risk assessment. Overall, the campaign drove more than 37,000 clicks among MHS’s target demographic of adults, ages 40-55. The Display Everywhere component alone garnered a 1.30% CTR, which is 69% higher than Pandora’s internal benchmark.